Wessels Glymatic system consists of a free-standing solutions reservoir that contains the glycol/water or water solution at atmospheric pressure. A pressurization assembly is mounted on the solutions reservoir’s high density polymer cover, keeping the pressurization unit off the floor. 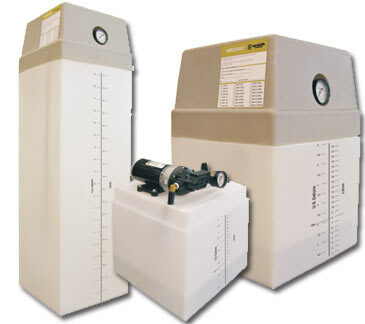 The Glymatic automatic make-up package utilizes a pressurization station designed to draw fluid from a 6 or 15-gallon reservoir and automatically feed pressurized fluid at regulated pressures between 1 to 25 PSI. This solution will remain stored at pressure until it is needed to replenish the system that has lost its glycol/water or water solution.